Nancy Silverton (La Brea Bakery), Mario Batali (eponymous culinary empire) and Joe Bastianich join forces to grace Los Angeles with two 'famous neighborhood gems' that sit side by side on the corner of Melrose and Highland. Pizzeria Mozza serves incredible gourmet pizzas (with creative combinations of toppings and the most amazing crust I've ever tasted) in a casual, intimate setting, while Osteria Mozza offers more committed (and wealthier) diners a unique, more upscale concept restaurant anchored by two bars (mozzarella / 'Amaro') and a dining area serving gourmet Italian/Mediterrenean dishes in a cozy space that feels like it's the most sophisticated restaurant in a sleep East Coast town where everyone who comes in knows each other. 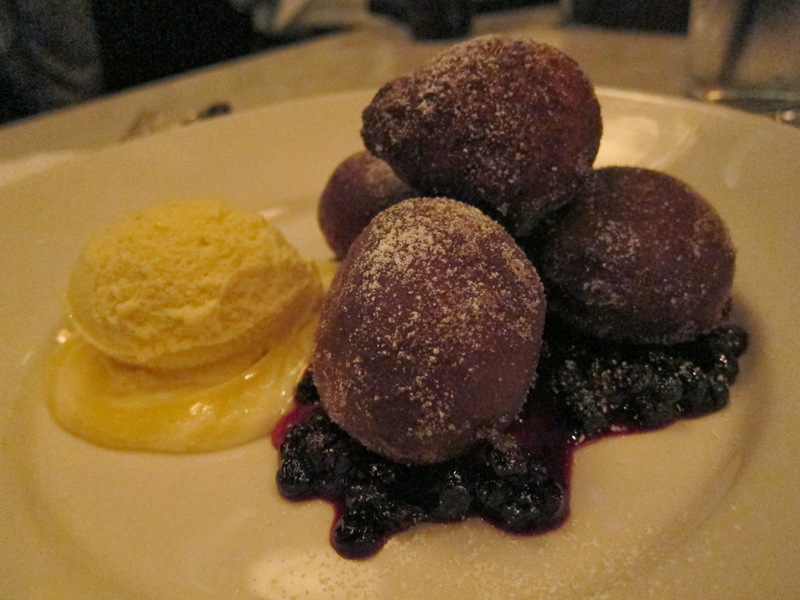 Pizzeria Mozza is hands-down my favorite place for pizza in the city - but in this post I'd like to talk about my night with its more upscale sibling - a Sunday evening adventure with the prix fixe menu at Osteria Mozza's Amaro bar. 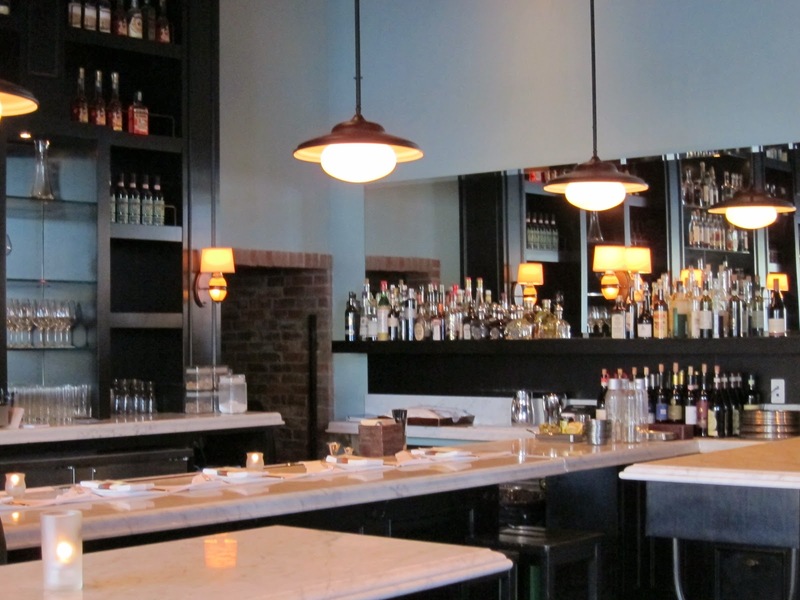 Every Sunday through Thursday Osteria Mozza offers a special three-course menu, available only at their Amaro Bar. You have to sit at the counter and can then choose: one item from Nancy's Mozzarella Bar (or share the Mozzarella Tasting for two), one Pasta, a Dessert and a glass of either Bastianich Friulano or La Mozza Morellino di Scansano - all for the amazing price of $35 (tax and service extra). They don't take reservations for these seatings - it's first come first served, so get there early if you want to take advantage of this menu! We arrived just before opening (5pm) on a Sunday - love free street parking! - and there was already a small crowd waiting eagerly by the entrance. After the excited diners politely piled in, we were happy to take the last two seats at the bar - which worked out really well, as we were right next to the service counter and were treated to lots of wine and champagne tips by the exceptionally friendly servers (one even asked my friend to help 'sample' the champagne when he popped open a brand new magnum, to make sure it was up to par!). The only minor 'not so positive' thing about sitting at the Amaro bar, is that you sit facing the wall of wines, turned away from the nice ambience in the dining room, and from all the action in Nancy's Mozzarella Bar, where you can often see Nancy working the exquisite cheese dishes herself! With the seating arrangements all sorted, we all but devoured the menu with ravenous eyes. The prix fixe menu allows you to choose one item from the full list of Mozzarella Bar options - the print alone made us salivate on sight. There were no less than 14 different configurations of cheeses (Bufala, Burricota, Stracciatella, Burrata) with intriguing accompaniments from braised artichokes to spiced walnuts to fried rosemary. We considered the task of selecting just one from among the incredible options an exercise in cruelty - though, when ultimately confronted by the sad reality that the size of our appetite was inversely proportional to the size of the contents of our wallets, we finally decided on the two dishes below. Starters from Mozzarella Bar menu: Burrata with leeks, vinaigrette and mustard breadcrumbs ($14)I had the burrata (incredibly silky smooth, creamy, and soft - melts away on contact in your mouth! ), topped with crunchy mustard flavored breadcrumbs, served on a thin strip of leeks sprinkled with pepper and marinated in a vinaigrette - a divine combination of perfectly contrasting textures and harmonious tastes! My Foodie Mentor, who has had my dish on a previous visit, ordered burrata (slightly firmer and more chewy than the one in my dish) topped by carmelized shallots, which sat atop salty bacon strips, cushioned by marinated escarole, which topped a round of toast. Again, a sophisticated layering of contrasting textures held together by a perfectly balanced blend of flavors. Being adventurous in no other area of my life, I am invariably drawn - when it comes to food only - to the exotic or unusual. 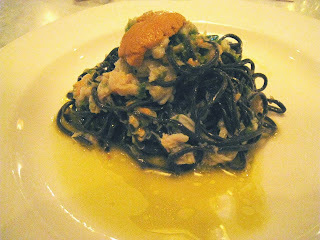 So for my first course, I had no choice but to order the squid ink spaghetti, which was served cold and punctuated by thick and fluffy chunks of Dungeness crab, topped by a sliver of fresh uni, and mixed in a jalapeno broth. 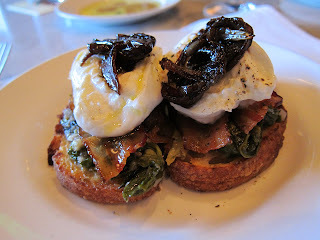 A surprising find on an otherwise authentic (and all mouthwatering) Italian menu! 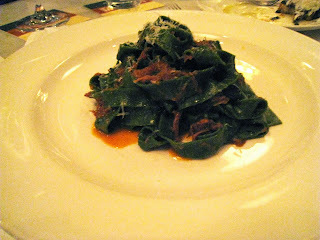 Foodie Mentor opted for something which was in comparisan a little more traditional - the tagliatelle verde with lamb ragu - but with a refreshing surprise ingredient added - mint! 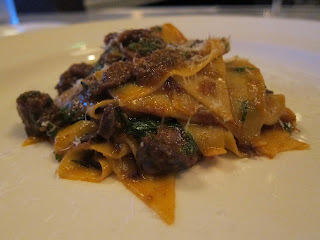 The dish was fantastic - with extremely tender and flavorful lamb mixed in with the perfectly cooked tagliatelle pasta. Dessert for me is usually the best part of the meal, but it would be hard to top my previous two courses! 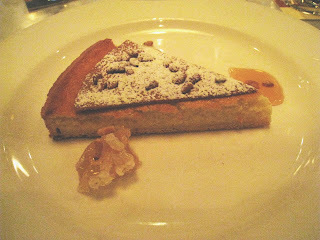 At first I was unsure about the Torta della Nonna 'cheesecake' - that seemed to me a little plain and unimaginative - but after the first bite, I see the light. This is not the dense clunker of a dessert you would expect from its English name - but turned out to be incredibly light and airy, with a perfectly crumbly crust, and a crunchy, flaky top layer sprinkled with toasted pine nuts. 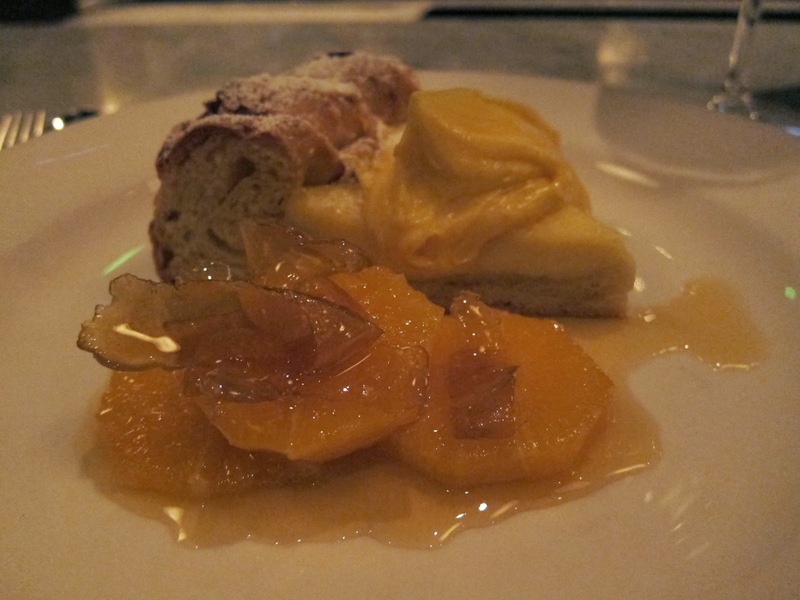 The only thing that made the experience even better was dipping pieces of fluffy cake into the small pool of light, amber-colored honey on the side. I wasn't as into the honeycomb side, which was a sticky dense glob which didn't add fit with the lightness of the rest of the dish, and didn't provide a complementary contrast either. 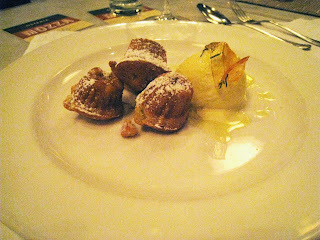 Foodie Mentor had the rosemary olive oil cakes (in the shape of mini-muffins and consistency reminiscent of donuts) plated with a scoop of olive oil gelato, topped by a flip of spun sugar that encased a sprinkle of needles of rosemary. I thought the taste was a little too subtle for me - but did appreciate the sophistication behind a dessert that wasn't 'whack-a-mole' style over the top sugary. All-in-all, an amazing meal at an incredible price - definitely need to come back again the next chance I get! Some more photos from another amazing visit to Osteria Mozza - still in my opinion the best deal in town for foodies with its very filling 3-course meal + glass of wine for $35! I will forever assess the value of every other meal in 'units of Mozza'!!! Update Summer 2011: The prix fixe at Amaro Bar is now $42 per person. 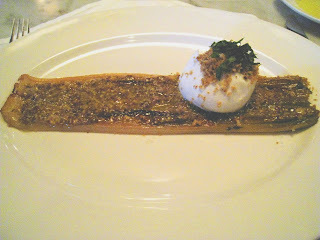 If you asked me to summarize dinner at Bistro LQ, I would have to say "intriguing culinary experiment - high potential". The sophisticated menu reads like something out of a Top Chef Masters episode - it's packed with all the words that make my taste buds tingle on sight, such as 'foie gras', 'truffles', 'uni' etc., but goes further to push the envelope with dishes containing exotic meat/fish/ingredients that are hard to find elsewhere in LA - sweetbread, pigeon, skate, wild boar, veal feet jam. It seemed as if the menu was designed to have a Pavlovian effect, and I was totally ready to be in foodie heaven - but like many experiments, some proved to work better in concept than execution. On arrival, we were greeted by the very friendly manager Eric Bouty, and led to a nice corner table. 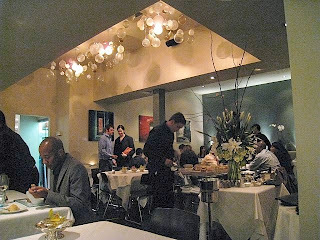 I am a huge fan of restaurants with elegant decor, but yet is not so pretentious that it makes you uncomfortable to be there, and which are smaller in size so that the space feels intimate and cozy - the perfect setting in which to enjoy good food and great company. Bistro LQ fit the bill on this - with its sea foam colored walls, glass orbs blooming from the ceiling, and orchid centerpieces at each table nicely offset in color by blue water glasses - providing a serene and lovely environment for the meal. The only minor note is that personally, I think the lighting could have been dimmed a little further to set the mood. The much-talked-about cheese cart was strategically placed near the center of the restaurant, the better for patrons to ogle all night in eager anticipation. 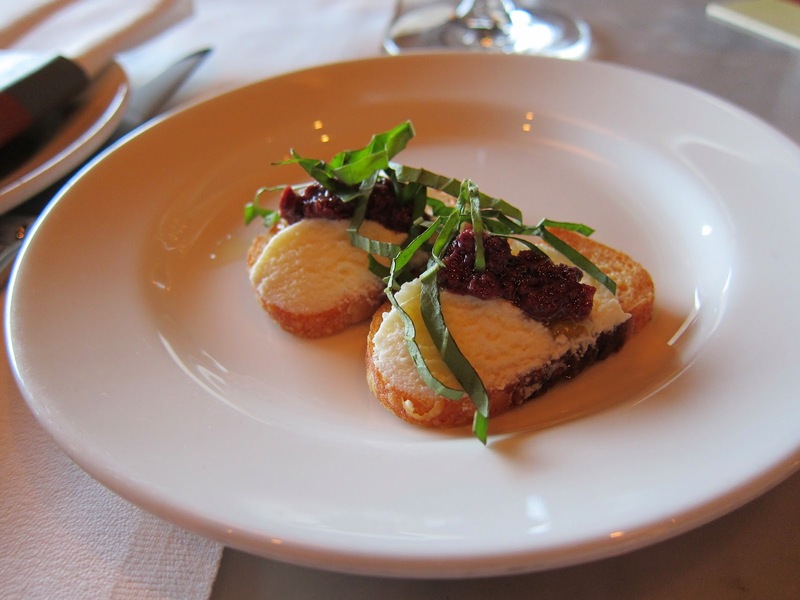 One of the best things about the menu at Bistro LQ is the option to order half-portions of most starter and main dishes, giving you the flexibility to try out multiple dishes. However, if you choose to order half-portions, there is a minimum requirement of three dishes per person - and not every dish is offered at half-portion. This was not a problem for me as I wanted to try absolutely everything! We started out with a complimentary amuse bouche - a twist on ceviche, with a mussel and some white fish in citrus marinade. 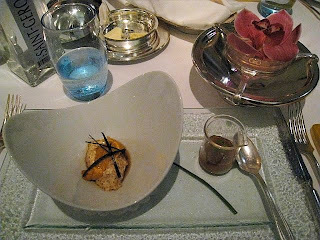 I ended up ordering the Uni to start - a Sea urchin tapioca pudding with yuzu kocho, and a kumamoto oyster in yuzu Martini gelee (the half-portion is served in a shot-glass sized beaker!). The concept, with its unusual combination of ingredients, intrigued me. Though the dish was a sensory adventure, in the end I think it fell a little flat in several areas: I believe the tapioca was supposed to evoke an exaggeration of the texture of uni (sea urchin roe) - however, combining similar textures only took away from the namesake ingredient that the dish was meant to highlight. The use of yuzu presented a similar issue - where the texture of the tapioca overwhelmed that of the uni, the flavor of the yuzu kocho overpowered the unique taste of the sea urchin roe. Part of the beauty of sashimi is its purity - it is the ability to savor something fresh from the ocean, which excites most fans. I am not a purist, and really wanted to like the unique parings in this dish - but instead of complementary flavors coming together - or offsetting each other to take the dish to the next level, I felt that the flavors in this dish did not meld well. Also, the pudding was a little dry for my taste - it felt like it may have been sitting out uncovered for a while. Kudos for creativity though, and courage to try something completely new. I also do want to praise Bistro LQ in one area - their portion sizes. Anyone would expect, based on this being a place that served haute-cuisine, that the very reasonable prices on the menu would translate into incredibly tiny portions - but every dish even at half-portion was very generous - I actually felt stuffed after the second course! For my second dish, I chose the Atlantic Skate Wing, accompanied by an egg roll filled with chanterelles and porcini mushrooms, and a chestnut emulsion. This dish was to me, perfect. 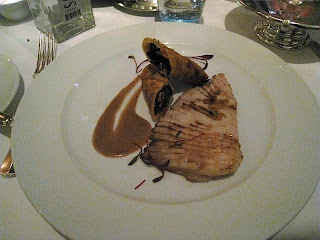 The fish was grilled perfectly, and its tender, flaky texture offset by the crispyness of the egg roll and the consistency of the mushrooms inside. I decided to be adventurous with my meat dish, and chose the Veal Kidneys and Veal Sweetbreads, with wild mushrooms, colman mustard jus and tarragon. It was my first taste of sweetbread! In this case, they used heart sweetbreads which had an amazing, smooth and creamy texture, nicely offset by the tougher, somewhat crunchy texture of the kidneys. The dish was extremely rich in flavor and one of my favorites of the night, though it would have been better served with a side of truffle fries, instead of the gratin of gnocchi with artichokes (which again had the problem of combining items that are too similar in texture - potato and artichoke hearts - that did not elevate each other. 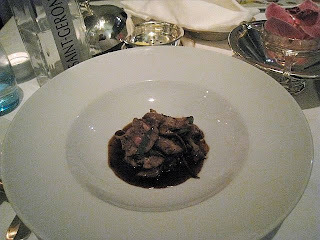 And since the veal dish was already rich and creamy, serving it with a rich and creamy side was a little too much). We were unfortunately too full after the meal for the made-from-scratch desserts, and will have to come back to try them another time. 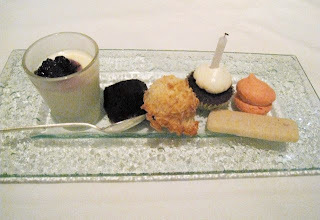 The restaurant did provide a tray of complimentary petit fours to top off the meal - which was fabulous in itself. The tray came with one each of: Parisian-style macaroon, baby red velvet cupcake, shortbread biscuit, coconut macaroon, mini chocolate cake and panna cotta in a shot glass topped with blueberry compote. All in all, this was an exciting culinary adventure and fun night out. Though some dishes were more impressive in concept, I enjoyed seeing Chef Laurent Quenioux's incredible creativity and enjoyment of food on display and appreciated his - there's no other way to say it - 'ballsy-ness' in pushing his artistry to the edge.